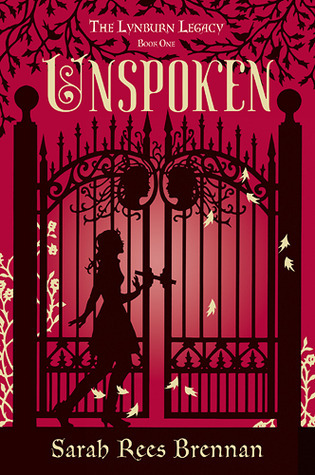 The Book Rat: Introducing February's #WednesdayYA Book Club pick: Unspoken by Sarah Rees Brennan! 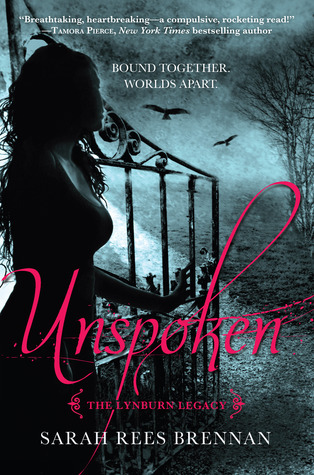 Introducing February's #WednesdayYA Book Club pick: Unspoken by Sarah Rees Brennan! I have to say, I'm pretty excited that this one won, because though I bought it on cover appeal I wanted it on pure cover appeal* (silhouettes! ), I've heard endless good things about it, and am definitely curious! I probably should have been pulling for one of the other choices, Sisters Red, because I could have used the review in Fairy Tale Fortnight, but I don't even currr, I'm ready for this one! But also . . . um - guys? Anyway, if you've been meaning to read Unspoken, or even if you haven't, but are like, Oooh, bookclub!, feel free to join Liz and I throughout the month of February as we read and discuss this book for #WednesdayYA! And if you've already read it, feel free to chime in throughout February, and join us for the twitter chat on the 19th. Now, before I let you go, I have one question: What would YOU like to see for next week's #WYA post? For Shatter Me, I did an excerpt vlog and an instagram quote post - would you like to see one of those, or is there some other way you'd like me to feature Unspoken this month? Let me know in the comments, and I'm looking forward to chatting with you guys about this Wednesdays throughout February! Awesome! really curious to finally read this author! Lol at the tweet.